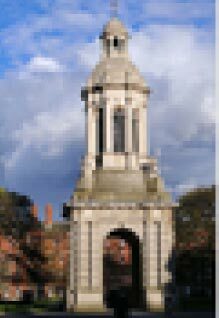 Trinity College (Irish: Coláiste na Tríonóide), formally known as the College of the Holy and Undivided Trinity of Queen Elizabeth near Dublin, is the sole constituent college of the University of Dublin in Ireland. The college was founded in 1592 as the “mother” of a new university, modelled after the collegiate universities of Oxford and of Cambridge, but, unlike these, only one college was ever established; as such, the designations “Trinity College” and “University of Dublin” are usually synonymous for practical purposes. It is one of the seven ancient universities of the British Isles, as well as Ireland’s oldest university. Originally established outside the city walls of Dublin in the buildings of the dissolved Augustinian Priory of All Hallows, Trinity College was set up in part to consolidate the rule of the Tudor monarchy in Ireland, and it was seen as the university of the Protestant Ascendancy for much of its history. Although Roman Catholics and Dissenters had been permitted to enter as early as 1793, certain restrictions on their membership of the college remained until 1873 (professorships, fellowships and scholarships were reserved for Protestants), and the Catholic Church in Ireland forbade its adherents, without permission from their bishop, from attending until 1970. Women were first admitted to the college as full members in 1904.